Large Cast Bronze Bell on Walnut base. P157A (Picture reference A) Measures 10 1/2" x 8"
P157B (Picture reference A) Measures 12" x 9"
P257 (Picture reference B) Measures 9" x 12"
P286 (Picture reference C) Measures 9" x 12"
P342A (Picture reference D) Measures 10 1/2" x 8"
P342B (Picture reference D) Measures 12" x 9"
P346 (Picture reference E) Measures 12' x 9"
P365A (Picture reference F) Measures 10.5" x 8"
P365B (picture reference F) measures 12' x 9"
CAST BRONZE - Elaborately detailed cast bronze axe with Maltese Cross logo, and 36" solid hickory handle. Chrome plate bronze ax - Elaborately detailed chrome plated bronze axe with Maltese Cross logo, and 36" solid hickory handle. Price includes red tassel. Walnut frame with mitered and dowelled corners. Measures 42" wide, 17" high and 2" deep. Includes Polished solid brass hooks hold your ax against a rich velvet background. Table Display holds one ax. Ax purchased separatly. Bust measures 10" overall heigth. Bronze portion is 7" high. Mounted on 3" walnut base. Bronze leather helmet (brown petina finish) mounted on 4" walnut base. Highly detailed with stitching, reflectors and scroll work. Helmet brim is 8" long by 6" wide by 4" tall. Overall heigth is 8". Price includes brass plate with three lines of engraving. Pike Pole top mounted on wooden shaft. Beautiful bronze Pike Pole Award. 22" tall mounted on walnut base. Includes red tassel and engraved brass plate. Mounted on a walnut base - this bronze Play Pipe is an award surtable for your top firefighters, retirees, etc. Price includes engraved brass plate. Beautiful chrome Pike Pole Award. 22" tall mounted on walnut base. Includes red tassel and engraved brass plate. walnut base with black brass plate. Measures 7" high. HE01-A Crossed axes (Picture reference D) Measures 3" x 2"
HE04-A Modern Pumper Truck (Picture reference E) Measures 3' x 2"
HE04-B Modern Pumper Truck (Picture reference E) Measures 4' x 2"
HE05-A Chief's Horn (Picture reference F) Measures 2" x 2"
HE05-B Chief;s Horn (Picture reference F) Measures 3" x 3"
HE03-A Antique Pumper (Picture reference G) Measures 3" x 2"
HE03-B Antique Pumper (Picture reference G) Measures 3 7/8" x 3"
ee individual plaques to determine which plaques accept logos. Please note engraving is not included in base price of some plaques. The charge will range between $15.00 to $30.00 depending on the wording, addition of logos, etc. Check each item to see if the engraving is already included. 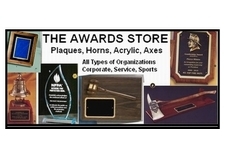 Please provide a detailed and exact listing of what you want on each award. This can be emailed to CH835@aol.com or faxed to 610-584-6304. Please provide a contact number with your order. Individually boxed pens. Ideal for awards or corporate meeting giveaways. Engraves with your company's name. Minimum order 5 pcs.